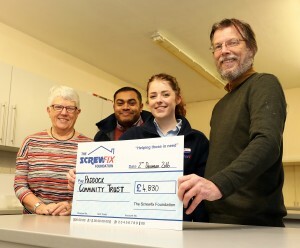 Paddock Community Trust, based in Huddersfield, is celebrating after being awarded £4,830 worth of funding from The Screwfix Foundation, a charity which supports projects to fix, repair, maintain and improve properties and facilities for those in need. The Kirklees Adult Learners’ Week Awards recognise the achievements of outstanding adult learners. For the Step by Step project, it was a fabulous evening at Huddersfield Town Hall on June 11th with several Step by Step attendees winning awards in the Individual and Group awards. Often winners will have transformed their lives and those of their families through getting a job, learning to read and write or achieving something they never thought possible. Winners have been through tough challenges and those experiences illustrate how learning can turn people’s lives around. Nominations are open to all organisations in Kirklees and winning an award is not easy. Nominated by their Step by Step Advisor through Greenwood Centre, Ravensthorpe library staff, Saima Bano Ishaq proudly accepted the Most Determined Learner of the Year Award. Mums to be support organisation won the Community Group of the Year Award and two Step by Step attendees were among the group with Auntie Pam’s staff to receive the award. Diane Hargreaves, who with the support of their Step by Step advisor gained employment as Assistant Project Administrator last October. Alongside Diane was her colleague Leanne who was referred to Auntie Pam’s to undertake the voluntary work she was inspired to do by her Step by Step advisor. Winning the award for the Skills for Life Group of the Year was the IT group from Fusion Housing. Among the group to win the award was Kenneth Kitson who attends the Greenwood Centre Step by Step session and Kenneth Sharpe from the Newsome Step by Step session. Both have developed their IT skills immensely and continue to develop their skills. 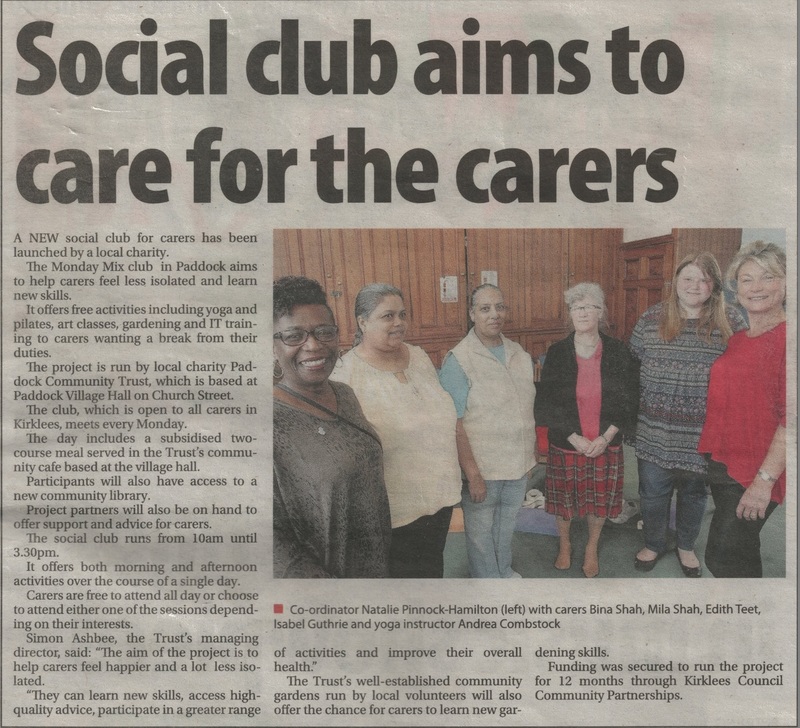 Monday Mix, a new weekly social club providing a range of activities and support for carers at Paddock Village Hall, is to be launched in June 2015 and will run for twelve months. Carer’s break funding has been secured by Paddock Community Trust to offer carer’s and isolated people an opportunity to take part in a programme of weekly activities such as arts workshops, computer training, fitness classes and gardening. Project partners, including Carer’s Count and Cloverleaf Advocacy, will also provide regular advice, information and advocacy support in the Monday Mix project. The funding was awarded by Kirklees Council Community Partnerships. The activities will take place every Monday from June 1st and will include a two-course lunch served in the Trust’s community café at Paddock Village Hall. The aim of the project is to help users feel happier and less isolated, learn new skills, access high-quality advice, participate in a greater range of activities and improve their overall health. The Social Club, running from 10 am – 3.30pm will offer both morning and afternoon activities over the course of a single day. Full use of the Trust’s amenities at the Village Hall will be made including a networked ICT centre, community library, training rooms and the nearby Branch Street Community Allotments. Participants will be free to attend all day or choose to attend either one of the sessions depending on their interests and needs. For more information about the programme or to join contact Paddock Community Trust on 01484 431400 or email info@paddocktrust.org.uk. For more information about the programme or to join contact Paddock Community Trust on 01484 431400 or email info@paddocktrust.org.uk. Paddock Community Trust Talk English are pleased that the Talk English staff, volunteers and community partners are proud winners of a British Council ELTon Award for Local Innovation.